I was chatting to someone in the playground the other day and they asked me what my son had read when he was ten? Ideally it would be a series. Of course it would, if you get a book that works and goes down well, why wouldn’t you want loads more of them? It’s an old moan of mine, but it seems really unfair that when we were growing up there was naff all to read if you were a ‘young adult’. When I was a boy I’d be given a Henry Treece book about vikings and sent off to bed. Fortunately those days are gone. Now there’s loads of choice. Bookshops are groaning with shelves of embossed dystopian thrillers and boy secret agents and girl footballers. That said, I think children read them more quickly than we used to. Maybe I’m just quite a slow reader, or maybe the children I’m around read very fast, but they seem to get through a lot more than I ever did. I remember (I can hear groans from my children) when I was young I used to be given a book by my parents for my birthday. They were usually books by an author who’s now dead (I think) called Ronald Welch. I loved them. 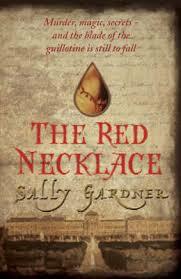 All period and all set during a time of war – they were classic historical fiction – my dad had the same thing when he was growing up only his were written by GA Henty. Anyway, they were always full of adventure and loads of battles and descriptions of armour, or rigging, or how a bolt action lee Enfield worked and so on. Perfect. Just what I wanted. Actually I’ve just worked it out, I didn’t read them more slowly, I just read them again and again. Less choice in the library, so you can’t just bulimically finish a book and reach for the next, you go back to the beginning and read it again. It needs to be a good book for you to do that, but maybe I just got lucky. Knight Crusader, Sun of York (wars of the roses), Ensign Carey (Indian Mutiny), Tank Commander, Captain of Dragoons (Wellington), Captain of Foot (Peninsular war) and so on. They were a lot of them, and they formed a sort of series because they were all about the Carey family, just different generations. Not a woman in any of them (except the odd mother). He also wrote a book called The Gauntlet which I think won some prize or another, that was aimed at fractionally younger readers (8 upwards), which didn’t feature the Carey family, but was really good. A young contemporary boy finds a gauntlet while he’s exploring a ruin, puts it on and bingo, he’s back in time. Fabulous. No excuses, no attempt at explanation, just a great way to get you into a time when boys fought battles and wore armour and did exciting stuff. Having thought these were all out of print I was very excited (as only a book geek can be) to discover they’re all being re-issued! There is quite a high body count and war is not prettified or sentimentalised in any way at all, but there’s no sexism (there are no women in them so that’s not hard) and none of the racism that makes so much of Willard Price so unpalatable. And talking of slightly hard to swallow, I nicked my son’s copy of Cherub the other day. It’s a series written by Robert Muchamore which is about teenagers who sort of work undercover having been specially trained to do the sort of stuff they need to do to defeat international drug traffickers and people smugglers and so on. They’re exciting, children really like reading them (both really important features in any book, let alone one for reading-resistant children!) but for some reason I wasn’t keen. They’re called things like ‘class A’ and so on and they deal un-apologetically with adult material – there’s also a slightly knowing sexual maturity aspect to some of the 11 or 12 year old protagonists which annoyed me. That makes me sound like a real prude, but actually I didn’t think there was any need for them to be written in as grown up a world/lexicon as they are, so if that makes me a prude then so be it. 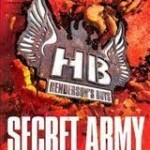 By contrast, the series Henderson’s Boys (by the same author) is brilliant – equally as violent, but because it’s set during the second world war there is a context to the violence, and its being ‘historical’ makes it feel less immediate. 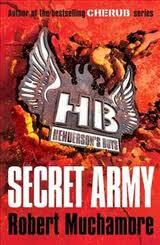 Probably a terrible double standard, but Henderson’s boys I really liked. It’s about a group of orphaned/abandoned/war torn kids who end up being taken in by a father figure (Henderson) and trained to be anti-Nazi agents. What’s not to like? The CH in Cherub stands for Charles Henderson but you probably don’t need to know that. Anyway, there are many many great history-ish series out there now – Obviously the all conquering Harry Potter, although that’s not really history, but there are plenty of others as well. This is a slightly younger series. It’s educational (perhaps a teeny bit too educational/preachy at times…), it’s been a TV series, it’s studied in schools and it’s got a female lead. It’s basically the famous five/the three investigators/the secret seven etc, but in Roman times. My favourite bit is that one of the boys is a mute – he’s had his tongue cut out. No shying away from that in the book, of which I approve. The TV series said he just chose not to speak, which seemed a bit of a cop out. The books do get a bit more gruesome as they go on, there’s one with a death in childbirth that left my daughter sobbing inconsolably. Any book that can excite that level of emotion has got to be worth considering! There’s also loads of them, which is a good thing if you’ve got a demanding reader on your hands. There is a younger version, but it didn’t really seem worth the bother – once they’re capable of reading The Thieves of Ostia (number 1) then there’s nothing in it that will upset them. Just be careful after about number six or seven. Caroline Lawrence is also very good at getting back to you if you email excitedly. 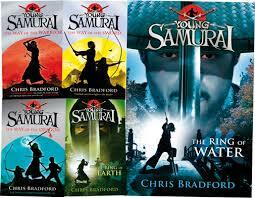 Another really imaginative series – this is what really got my son reading. He saw the trailer in the cinema and asked if he could go and see it. I said he could as long as he read the book first (I remember staying up really late to finish Watership Down before I went to see it for my birthday) – by the time he went to see the film he was reading the fourth book in the series. They are exciting, cool and teach you loads about the Greek myths. The basic story is that the Greek Gods are alive and well and living on Olympus which you access by going to the top of the Empire State Building. But they have also created Demigods (the offspring of them having flings with mortals) who exist on earth. These demigods have special powers but are not safe so they find their way to ‘camp half-blood’ where they are trained – sort of X-men style. There are quests, adventures, swords, etc. It’s great. They are thoroughly modern (when Percy/Perseus geddit? is facing Medusa he uses the shiny back of his ipod to avoid being petrified) and exciting. More of the same only now it’s Egyptian Gods and magicians. 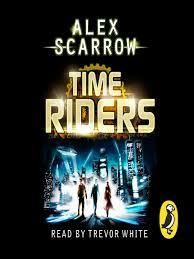 Not sure these are quite as good, but still interesting and well written. My fave contemporary YA series. 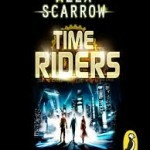 Maybe for a little older than 10, but they’re really exciting – I’ve mentioned them in other posts – the idea is that time travel has been invented in the future and they’ve realised how damaging it can be so they’ve sent young people back in time to fix things. As something changes in the past so it changes the present and reality shifts accordingly. Great idea, and it is well explored, the philosophical questions are asked and so on. There’s also always a race against time and the team are split, half in the past, half in the present and so on. Boy goes to Japan and becomes samurai. Very exciting but quite brutal. Many many deaths. Well researched and culturally interesting. 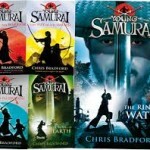 Chris Bradford is currently on another series about a bodyguard, haven’t read it yet. Only two of them so not strictly a series, but so good they have been included. Both set at the time of the French Revolution they are exciting and possibly a tiny bit more grown up than some of the others on this list. 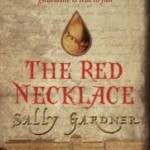 Anything by Sally Gardner is really good though; I Coriander in particular.